Armwood Editorial And Opinion Blog: GEORGIA ELECTION: Kemp's lead shrinks, Abrams to file new lawsuit. Abrams campaign readies federal lawsuit seeking more ballots to be counted. GEORGIA ELECTION: Kemp's lead shrinks, Abrams to file new lawsuit. Abrams campaign readies federal lawsuit seeking more ballots to be counted. 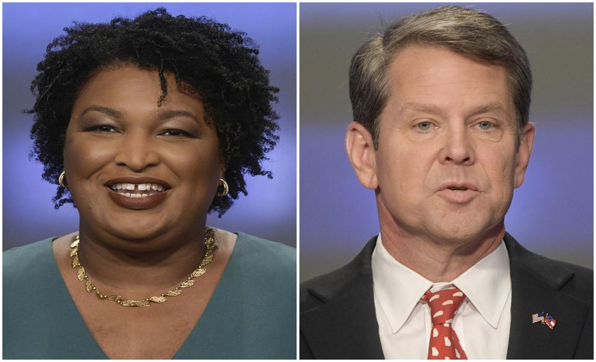 The clash heightened as a cache of 5,500 provisional and mail-in ballots were reported that showed Kemp’s lead over Abrams shrinking slightly to about 59,000 votes. Some came from counties that days earlier reported all votes had been tallied. The newly-reported votes overwhelmingly tilted to Abrams and triggered a wave of celebration for Abrams’ supporters. But she still needs to net about 22,000 votes to force a Dec. 4 runoff, and there aren’t many votes that have yet to be reported. It’s unclear, however, just how many votes are still outstanding. Kemp’s campaign said there are so few remaining that it’s mathematically impossible for Abrams to win, but the Democrat said there’s a larger cache of votes still unreported. No major media outlet has yet called the race, and with a margin this tight they are likely awaiting the certification of the votes this week. The Atlanta Journal-Constitution does not call election contests. Abrams’ hopes rest largely on provisional ballots cast by voters whose information often could not be immediately verified at polling places. Not all the ballots will be counted, but the Democrat hopes there are enough to gain ground on Kemp. A federal lawsuit readied by the Abrams campaign could change the dynamic. It asks the court to require absentee ballots rejected for “arbitrary” reasons, such as a mistake in a birth date or missing information, to be counted. As many as 2,000 ballots were dismissed because of such problems. And it would require counties to accept provisional ballots that were rejected because the voters live in a different county. Abrams’ campaign said this could affect thousands of additional votes. After the lawsuit was filed Sunday, the State Election Board convened a special called meeting and voted unanimously to send a letter to all county election offices about how to count absentee and provisional ballots. Gwinnett County rejected 1,587 mailed ballots, often because they were missing birth dates, according to public records from the Georgia Secretary of State’s Office. Across the entire state, election officials rejected a total of 5,147 mailed ballots. To give counties time to process these changes, the lawsuit seeks to block counties from certifying results of the election until Wednesday. The deadline is now Monday, though because of the federal holiday many counties plan to certify on Tuesday. The secretary of state’s office – recently vacated by Kemp – reports 21,190 provisional ballots, many of them yet untallied. The Abrams campaign offered a higher figure it said was compiled through a canvass of county data. One of the biggest gaps is in Gwinnett County, where Abrams’ campaign reported there were an additional 3,500 provisional ballots that the state figures don’t account. State and local officials said that Abrams’ number is incorrect. If there’s a window for Abrams, it’s narrowing. At least 89 counties have already certified their votes, and 118 counties have reported some results from provisional ballots. Roughly half of the provisional ballots have been rejected, but those that reported on Saturday helped Abrams net about 2,000 votes. About 40 counties had yet to report their final provisional ballots by Saturday afternoon, including many larger left-leaning counties where Abrams stands to gain votes. One of the largest is Fulton County, which on Friday reported rejecting 1,556 of the total 3,722 provisional ballots cast. Nearly 1,000 of the ballots were disqualified because they were out of county, and another 581 were not registered to vote. Three were rejected because they weren’t U.S. citizens. "It is mathematically impossible for Stacey Abrams to win, force a runoff or trigger a recount,” said Kemp spokesman Ryan Mahoney. “Georgia voters have spoken. It's time for Abrams to listen and concede immediately." That line was echoed by a range of Georgia Republican leaders and conservative figures, and amplified by President Donald Trump, who demanded on Twitter that Abrams concede. That’s not likely to happen anytime soon. Abrams has repeatedly said she will continue her campaign until all ballots are counted, and unveiled a litigation team that’s already filed a successful lawsuit requiring Dougherty County to accept a few dozen late-arriving absentee ballots.